You loved Parisian Chic, the runaway 2011 New York Times best-seller by French fashion icon Ines de la Fressange, right? So did we. 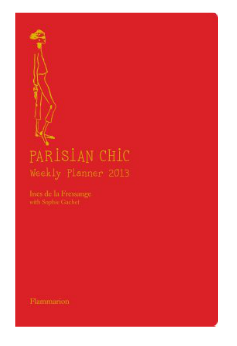 Then you’ll really dig her recently released weekly day-planner if you want a daily dose of how to “Dress like a Parisian” in 2013. And believe us, the globe could use a little more Parisian chic, don’t you think? Abundantly filled with all-new charming tips, secrets, and recommendations, it is accompanied by the author’s signature gamine drawings. This is a weekly planner that French fans found essential last year, and which we will now get, in English, to covet in the coming year. Parisian 365. We really love that. This planner is modeled on the soft-cover, portable Moleskine journal, will be a must-have for any woman who wants to add a daily touch of Parisian flair to her own style in 2013. The author Ines de la Fressange knows a thing or two about Parisian chic.She started as a runway model, became the face of Chanel, and lthen aunched a clothing line. She has long been the essence of Parisian style and elegance. Her drawings have regularly appeared in Elle and she is a brand identity consultant for Roger Vivier.Sophie Gachet is a fashion journalist for French Elle and was co-author of Parisian Chic: A Style Guide by Ines de la Fressange.